AAA or triple stands for the ‘Attack Azmin Ali’ campaign. After ousting previous Selangor Menteri Besar Khalid Ibrahim, it is now time to bring down the current Selangor Menteri Besar Dato Seri Azmin Ali. When Malaysia Today first revealed Azmin’s February 22, 2015 meeting with Tun Dr Mahathir Mohamad in London, not many batted an eyelid. That was because Anwar Ibrahim and those in his inner circle — such as his team of political strategists (see the photograph below) — already knew about the meeting. In fact, it was Anwar who had asked Azmin to fly to London to meet Mahathir. But Azmin was supposed to meet Mahathir to talk about a deal of mutual benefit. Basically it was supposed to be a win-win deal. Pakatan would support Mahathir’s ANC (Anti-Najib Campaign) while Mahathir, in turn, would support Anwar’s FAC (Free Anwar Campaign). However, Azmin never once raised the issue of Anwar. They just discussed how the opposition can support Mahathir’s bid to oust Najib with no discussion at all on Mahathir also supporting the bid to appeal for a pardon for Anwar so that he not only can be freed from jail but would also qualify to re-enter politics without first having to go through a five-year ban. In short, the deal was to make it possible for Anwar to be able to contest the 2018 general election in two years’ time instead of having to wait till 2028 when he would be 81 years old before legally being allowed to contest the general election. Azmin was supposed to discuss with Mahathir how they could ‘buy’ Anwar the ten years he needed so that he could re-enter politics when he is still 71 instead of having to wait till he is 81. Azmin, however, did not do this. He discussed everything and all sorts of things with Mahathir except for that one very important thing that Anwar wanted them to discuss. And that one very important thing was Anwar’s freedom so that he could came back as the de facto Opposition Leader and also contest the next general election in 2018, both which are now pies in the sky. But then this was what Malaysia Today wrote more than a year ago. And Malaysia Today always lies. It never tells the truth. So no one, either Anwar or those four ‘political strategists’ in the photograph above, took any notice of what Malaysia Today wrote. And then, as time went on, they started to realise that Malaysia Today was not ‘talking kok’ as they first thought after all. Malaysia Today was implying (or maybe even alleging) that Azmin had sold out Anwar and was attempting to replace Anwar with Mahathir as the new de facto Opposition Leader. But that would never happen because Azmin would bend over backwards for Anwar if need be (figure of speech of course and not literally) — or so they thought. Today, that assumption has changed. And it changed not because Malaysia Today revealed 15 months ago about what Azmin discussed with Mahathir in London. It changed because Azmin himself has proven that Mahathir and not Anwar is his boss. But then Azmin cannot help himself. That was the promise Azmin made to be able to become the Selangor Menteri Besar — that he would dump Anwar and not serve Anwar any longer. But whom did Azmin make this promise to? To who did Azmin promise that if he were appointed the Selangor Menteri Besar he would no longer serve Anwar or pledge loyalty to Anwar but would dump Anwar? Yes, a most interesting question, don’t you think so? And I am sure some of you already suspect who that person is. Nevertheless, I am not going to mention his name just yet although I cannot promise you that some time in the future I will reveal who that person is. Suffice to say that Azmin got the job as Selangor Menteri Besar on the agreement that he must turn his back on Anwar. And Azmin delivered his promise, although only 18 months later, by ousting Anwar as the de facto Opposition Leader and by not getting Mahathir to agree to a pardon for Anwar and by supporting Mahathir as the new de facto Opposition Leader to replace Anwar. Anwar plus his four political strategists in the photograph above now know that Azmin has sold them out. At first they also excitedly supported Mahathir’s ‘Save Malaysia’ campaign and the Citizens’ Declaration. But when they realised that the ‘Save Malaysia’ campaign was really about making Mukhriz Mahathir the next Prime Minister and that it did not include allowing Anwar to walk out of the Sungai Buloh Prison, they launched the AAA or ‘Attack Azmin Ali’ campaign. Azmin has his own ambition. And his ambition is to no longer walk in Anwar’s shadow and to continue to be called ‘Anwar’s boy’. Azmin wants to be the new PKR party president. But to win the party presidency he needs to abandon Anwar and his family. He needs to show he is his own man and not ‘Anwar’s boy’. The alarm bells were first triggered when Azmin started talking about his ‘relationship’ with Mahathir and how blood is thicker than water and how the past is the past and we should let bygones be bygones and forgive and forget, and so on. This was a far cry to the Mahathir is penghianat negara and the most corrupt Prime Minister in history, and should be hounded until lubang cacing, and so on, during the Reformasi days. So now the AAA campaign is on. First Anwar wrote that very damaging letter from prison which appeared to be attacking Mahathir but was actually attacking Azmin. And then Rafizi leaked the allegation of corruption, that involved ‘supplying women’ as well, committed by a certain unnamed person in the Selangor government. Dr Wan Azizah Wan Ismail has asked Rafizi to go lodge a report with the MACC, which he is going to do next week. We can only assume that Rafizi has enough evidence or else he would not have made that expose and would not be going to meet the MACC next week. 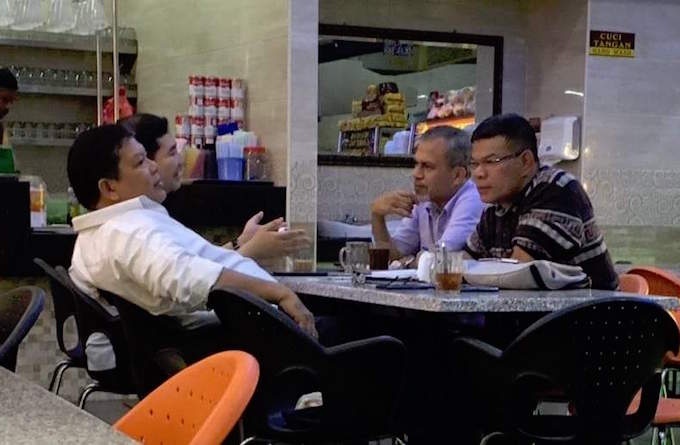 By the way, Rafizi and the other three in the photograph above were the same ‘political strategists’ who were behind the earlier Kajang Move to bring down Khalid Ibrahim. And they are also the same four behind the AAA campaign to bring down Azmin Ali. Just when I thought 2015 was the most interesting year in a long time, 2016 may yet prove to be more exciting. Oh, and this is not all. While all this is going on, the Penang Chief Minister, Lim Guan Eng, is also making his deal with Mahathir, just like Azmin is. Guan Eng knows he cannot escape the corruption charge involving his house so he is getting Mahathir to help get the MACC to back off. Mahathir is able to tell the MACC what to do so Guan Eng needs Mahathir’s help to escape jail. That is why DAP is 100% behind Mahathir’s ‘Save Malaysia’ campaign and Mahathir’s Citizens’ Declaration — plus also supports the move to make Mukhriz the next Prime Minister if they can first of all oust Najib somehow. And what about Kelantan? Yes, of course Mahathir has his fingers in the Kelantan pie as well. Mahathir is behind a certain PAS leader who might soon join Amanah and then become Mahathir’s candidate for the Menteri Besar of Kelantan. So Amanah had better get used to the idea that if Amanah or Pakatan Harapan manages to grab Kelantan from PAS, the man who is going to become the Kelantan Menteri Besar will be the man whom Mahathir says shall be Menteri Besar and not the man who Amanah wants as Menteri Besar. Posted in Anwar Ibrahim, Elections, Governance, Human Rights, Justice, Leadership, Najib Razak, PKR, Politics, Raja Petra Kamaruddin, Tun Dr. Mahathir Mohamad, Umno Baru. In today’s virtual world, we are fast and forthcoming with our opinions about pretty much everything we read by liking, sharing, commenting or offending friends and strangers alike. Shakespeare’s dejected Prince Hamlet utters the most famous of all soliloquies – to be or not to be -while complaining about his unjust and painful life. In an updated version, Hamlet 2.0 would have to contemplate his virtual life, the one he posts on Facebook, Twitter, Instagram and Snapchat, and measure its worth by the number of clicks, likes and retweets he gets. Imagine 21st century Hamlet, 2.0 for short, navigating the treacherous realm of his new social but virtual kingdom. His FB-“friends” Rosencrantz and Guildenstern seem to be attending parties, to which 2.0 has somehow not been invited. His mother Queen Gertrude looks toned and tanned on the Snapchats of her and King Claudius’ state visits abroad. His one true friend Horatio posts a harsh reply to Hamlet’s invitation to attend his upcoming duel with Laertes, brother to his girlfriend Ophelia. Hamlet blocks his friend’s posts over this disagreement. Gertrude gets involved, retweets the invite and ‘likes’ it. Claudius is outraged and promptly unfriends his wife. Prince 2.0, in a bid to avenge his mother’s honour, stabs the king with his own, poisoned, ‘unfriend’ button. Both he and Laertes, busy with all this commotion, neglect to like each other’s pre-duel status updates, which in turn, earns them a stabbing with the poisoned button of virtual death. In his last tweet, Hamlet 2.0 proclaims, “the rest is silence”, and dies. And Horatio? He publishes his first ebook, “Chronicles of a virtual death” on Instagram. Today, we look upon the story lines of the great classical tragedies à la Hamlet, Macbeth and Dr Faustus with a mildly benevolent eye and find them hugely exaggerated. We might have to revisit their features though, and compare them to our modern, net-driven narrative with a more critical appreciation. Veteran users of the first hour will remember a time when Facebook kept us informed about the simple facts of life; our friends were up, had breakfast, or lunch, and ventured into the neighbourhood shopping mall. And we didn’t care; or we were just happy to know that someone had a good day. Boy, how times – and posts – have changed! In today’s virtual world, we are all fast and forthcoming with our opinions about pretty much everything we read. We like, we share, we comment and we offend, on friends’ and strangers’ walls alike. But how do we offend, or even worse, get offended, so easily? Shakespeare knew that “there is nothing either good or bad, but thinking makes it so,” as he has Hamlet explain to Rosencrantz. In philosophical terms this means that nothing is real, except in the mind of each individual, and therefore the same statement can and will be perceived differently by different individuals. We post our relative truth on social media for the world to see, a sort of passive-aggressive exhibitionism, and open up a plethora of avenues for unwanted argument, while all we ask for is a “like”, a sign of consent. Translating playground etiquette to grownup social networks has created a virtual world of sissies, where we are to approve, agree and acknowledge everything others say. We eliminate the ability to be critical, the right to criticise; we create intellectual ‘safe spaces’. Back when we only posted the enlightening fact of eating breakfast, such safe spaces served us just fine. But today, as activists and news channels compete for views and clicks and entire presidential campaigns are fought on social media, safe spaces are dead spaces; they hinder intellectual progress. Instead of shielding behind the walls of our padded virtual world of mutual and undifferentiated acceptance, we should embrace the opportunity to cross – again virtual – swords with friends and with the world at large and learn how to properly use, respectfully express and intelligently accept a critically thought out argument. Hamlet killed his critics with a sword and Macbeth stabbed them with a dagger. Today, we use a thumbs-up or the lack of one. To post or not to post? By all means, post, and be part of a new kind of classical tale, but don’t let it turn into a tragedy. Fanny Bucheli is an FMT columnist. Posted in Civil Rights, Creativity and Innovation, Critical Thinking, Ethics, Politics. In mid-March, a Chinese Coast Guard rammed one of its own fishing boats to pry it free from Indonesian authorities who had seized it for illegal fishing off the Natuna Islands – the northernmost undisputed Indonesian island group. The incident has put a spotlight on Indonesia’s foreign policy under President Joko Widodo or Jokowi. Analysts have carefully examined the incident in great detail (seehere and here). 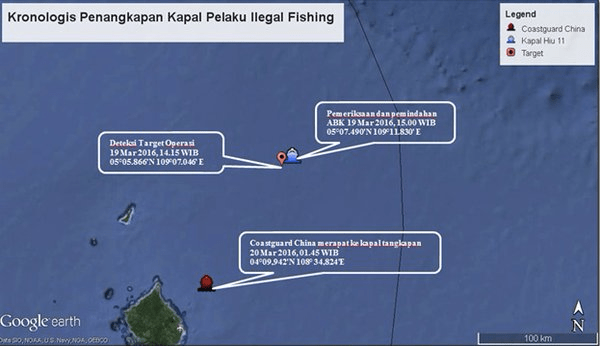 In the incident’s wake, the Foreign Minister, Defense Minister, and Fisheries Minister responded in different, and somewhat overlapping, ways. The Fisheries Minister has become the public face for Indonesia’s visibly angry response, while the military, according to press reports, continues preparations to upgrade its facilities in the Natunas. Several diplomats wrote op-eds slamming Beijing for its disregard of the United Nations Convention on the Law of the Sea (UNCLOS) and the rules-based order Jakarta has always pushed for in the management of the South China Sea. Jokowi’s Chief Foreign Policy Adviser, Dr. Rizal Sukma who is currently Ambassador to London, noted the importance of illegal, unreported, unregulated (IUU) fishing as the common challenge for Indonesia and China; rather than sovereignty as the Natunas are undisputedly Indonesian in the first place. 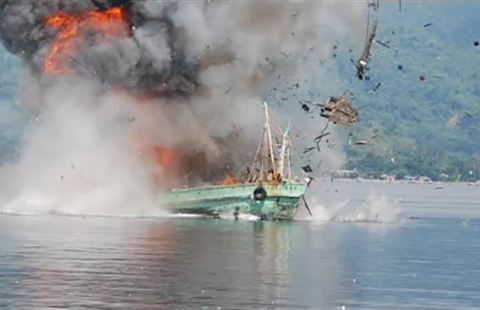 Indonesia destroyed 23 foreign fishing boats, as worsening relations over the disputed South China Sea drive countries to take tougher action to defend their maritime sovereignty. This seemingly incoherent response reveals some of the broader trends in Indonesia’s foreign policy in recent years. First, despite the growing literature on how the post-1998 democratic transition and consolidation has overhauled foreign policy-making, foreign policy remains strongly, perhaps even idiosyncratically, a presidential affair. This is partially a legacy of the centralised system entrenched under Suharto’s New Order, and partially because successive post-Suharto Presidents never paid serious and sustained attention to developing a professional, well-funded foreign ministry and a well-oiled foreign policy-making system – particularly one that can spans different parts of the government to harness the country’s different tools of regional and global engagement. For almost two decades after 1998, only the organisational reforms instituted under Foreign Minister Hassan Wirajuda are noteworthy. But even those reforms were not well-funded, nor were they sustainable given some of the entrenched bureaucratic challenges and the ebbs and flow of presidential support. It is not surprising therefore that the personal characteristics of different post-Suharto presidents shaped and shoved Indonesia’s foreign policy. What this means is that Jokowi’s personal aloofness on foreign affairs, his seemingly narrow domestic economic agenda, and his concerns with domestic politics, have prevented the Office of the President to marshal the nation’s strategic community to forcefully, coherently, and consistently respond to day-to-day challenges, including in the South China Sea. Furthermore, the absence of a dedicated foreign affairs staff inside the Presidential Palace (or an executive National Security Council, for that matter), the departure of key foreign policy advisers, and the increasingly lack of chemistry and trust between the President and Foreign Minister, Retno Marsudi, have further exacerbated this problem. Second, Jakarta’s over-reliance on the “non-claimant honest broker” position on the South China Sea suggests the `path dependence’ of institutionalist thinking within the Foreign Ministry. Two strands of institutionalist thought are particularly salient: the belief in the virtues of international law along with a rules-based order underpinned by UNCLOS 1982, and the utility of multilateralism and ASEAN. The first strand goes back to the 1956 Djuanda Declaration and has been sustained and strengthened by a series of influential diplomats and foreign ministers trained in international law for the past several decades. In the early 2000s, there were reports of a growing network of influential diplomats under the tutelage of Foreign Minister Wirajuda that came through the Indonesian representative office in Geneva (all steeped in international law). The second strand goes back to the founding of ASEAN (1967) and the New Order’s efforts to ensure domestic stability and regime maintenance by pushing for regional stability in Southeast Asia. Indonesia’s leadership of the grouping and its position as the country’s foreign policy “cornerstone”– and the fact that many of Jakarta’s achievements were done within a multilateral framework — has sustained this institutionalist thinking. According to a former member of Jokowi’s transition team, these institutionalist strands of thought often crowd out other “scenario-based realist” thinking on foreign policy, which is often critical in dealing with developments in the South China Sea. The institutionalist thinking has also led to push backs from the broader strategic community (including defense and fisheries ministries) in Jakarta concerned with China’s militarisation of the region and its constant encroachment of Indonesia’s maritime territories. Third, given the previous two trends, Indonesia’s foreign policy-making requires better and improved inter-agency coordination and collaboration and larger funding and resources. When it comes to the South China Sea, the Coordinating Ministry for Political, Legal, and Political Affairs should get the Foreign Ministry to talk more regularly to other agencies, particularly the Navy, Maritime Security Agency, and the IUU fishing task force of the Fisheries Ministry. The Foreign Ministry should also invest more in sending senior officials to attend regular inter-agency meetings and expand the number of senior diplomats sent to inter-agency courses, such as those run by the National Resilience Institute. Given the prevalent view that Indonesia’s best and brightest tend to join the Foreign Ministry, policymakers should not let it become an isolated actor within the broader national security system and establishment. Additionally, House of Representatives’ Commission for Defence, Foreign Affairs and Information – charged with discussing issues related to its portfolio and formulating plenary bills for consideration by parliament –needs to be more involved in foreign policy-making and increase the budgetary resources for the Foreign Ministry. The current budget only stands at roughly $549 million, with roughly 80-85 per cent devoted to routine expenditures and personnel salaries. This lack of budgetary support is not unique to Jokowi of course. According to budgetary documents compiled by CSIS Jakarta, the Foreign Ministry’s annual budget from 1999 to 2014 leveled at around $305 million on average, or roughly 0.69 per cent of the national budget. We should bear in mind these broader trends and limitations in Indonesia’s foreign policy-making when expecting Jakarta to play a more proactive role in balancing the ongoing US-China strategic rivalry, and the peaceful management of the South China Sea disputes. Evan A Laksmana is a researcher at the Centre for Strategic and International Studies (CSIS), Jakarta, and a political science doctoral candidate at Syracuse University’s Maxwell School of Citizenship and Public Affairs. Posted in ASEAN, ASEAN Economic Community, Communications, Defence-Security, Dr Mahathir, Foreign Policy, Geo-Politics, Govenance, Politics, South China Sea Dsipute. In the Mekong River’s 4,800 km journey from the snow-capped mountains of Tibet to Vietnam delta, the Sipandon area in southern Laos stands out as a critical part of the river‘s ecosystem, blessed by raging waterfalls, picturesque islands and a small colony of endangered freshwater dolphins. Sipandon – meaning 4,000 Islands – is an area of immense biodiversity, ecotourism and abundance of fish migration, but its survival is at serious risk from the hydropower Don Sahong dam, which is on the verge of construction. “If this special wetlands zone is protected, it could be one of the great wonders of the world”, Carl Grundy-Warr, a geography professor at the National University of Singapore (NUS) told Asia Sentinel. But instead of signing up to the Ramsar Convention for Wetlands Protected Areas, the Lao government has opted for a dam that will block fish migration through the Sahong channel, bypassing the waterfall at Khone Phapeng. Mega-First Malaysia, the Malaysia-based co-developer of the 256 mw dam project along with the Laotian government, faces opposition from hundreds of NGOs in Cambodia, Thailand and Vietnam. More than 300,000 people have signed petitions to attempt to stop the dam, and Cambodian communities have staged demonstrations. Even after calls from Mekong River Commission experts and constant calls by the governments of Cambodia and Vietnam to suspend all construction, however, preparations have steamed ahead. But now there appears to be a glimmer of hope for the 60 million people whose lives depend on a healthy, free-flowing Mekong. Dam construction that had been scheduled to start last month has been delayed. Mekong specialist Brian Eyler, Deputy Director of the Washington, DC-based Stimson Center, views the delay as linked to “a recent flurry of meetings between the governments of Laos, Vietnam, and Cambodia in the past two months,” trying to resolve the conflict over dams on the lower Mekong. A spokesman for the Mekong River Commission confirmed that “the matter is no longer in the hands of the MRC. It’s now in the hands of the governments,” referring to the three member states but without any reported participation by Thailand. Laos has up to now refused all requests from the riparian countries to engage in a joint scientific investigation of dam impacts and trans-boundary studies and suspend or postpone all dam construction on the mainstream river. Eyler believes the current pause in the dam’s development could be attributed to downstream neighbors putting diplomatic pressure on Laos. 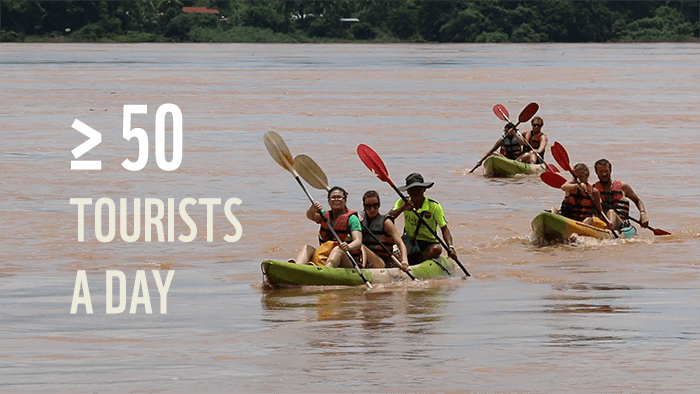 The impact of this projected dam, the Xayaburi dam and nine more scheduled to be built across the Mekong would also have a devastating impact much farther down river. Seven dams on the Chinese stretch have already reduced the natural flow of nutrient-rich sediment to the delta, the rice-bowl of Vietnam, which accounts for 20 percent of the world’s rice exports. If Vietnam is getting tougher with Laos, their long-time Indochina ally, it is hardly surprising. Laos unilaterally proceeded with the construction of the first dam on the lower Mekong – the Xayaburi dam, now 60 percent completed – and brushed aside demands by the riparian countries for comprehensive environmental impact studies. China’s Sinohydro has contracted to build the dam and has completed a bridge linking the dam site on an island to the mainland. The Irrawaddy Dolphin is regarded as a sacred animal by both Khmer and Laos people with a rounded head and measures up to eight feet in length. The Laotian hydro project threatens the survival of this friendly animal. The Mekong supports the world’s largest inland fishery with an estimated annual harvest of 2.2 million tonnes of wild fish, annually worth US$7.8 billion according to a report released in October by Ian Cowx, director at the Institute of Fisheries at Hull University in the UK. Mega-First counters that their dam will include extensive fish mitigation that would divert a wide variety of fish species away from the Sahong to smaller channels that have been widened and deepened. However, independent scientists have rejected these claims. Fish mitigation imported from other parts of the world, they argue has no track record of success when applied to tropical rivers. Although during the MRC consultation process the overwhelming response from riverine communities Cambodia, Thailand and Vietnam rejected the dam, the toothless Mekong River Commission has no veto right. Duong Ni, Director of the Center for Biodiversity at Can Tho University in the delta has expressed strong concern that the US-backed Lower Mekong Initiative has focused only on climate change while paying little attention to what scientists consider to be an even worse threat: the dams being built upstream. 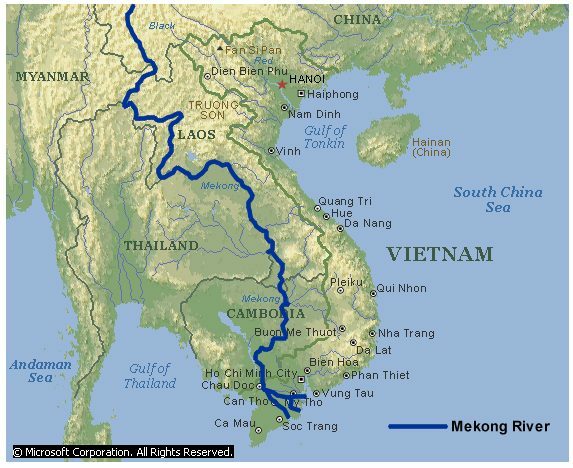 Research by the Stimson Center provides the outline of an alternative energy strategy that could protect the Mekong from more mainstream dams, and potentially generate even more income than their current strategy. In their latest paper New Narratives on the Mekong, they address this very point as part of an innovative plan for conflict-resolution on the Mekong. Cooperation to supply energy grid? Laos lacks a national electricity grid. If assistance were given to the land-locked country to create one, the Stimson report argues that could enable potentially more net export revenue with fewer mainstream dams while also reducing or eliminating the current need to import electricity from Thailand. Laos is already building large numbers of dams elsewhere other tributaries to supply such a national grid, which would not generate the diplomatic fallout engendered by the Don Sahong dam conflict, and any other dam on this international river. International support for Vientiane to turn to renewable energy such as solar and wind-power could also play a part in the conflict resolution. But if current diplomacy fails, then the Mekong River Commission, founded on the mantra that the Mekong is a river of international cooperation, friendship and respect for shared water resources, is clearly dead. Tom Fawthrop (tomfawthrop@gmail.com) is a Chiang Mai-based journalist and filmmaker specializing in Southeast Asia. Posted in ASEAN, ASEAN Economic Community, civil society issues, Environment, Governance, Holistic and Balanced Development, Human Security, Politics, Public Accountability. One wonders whether PKR was caught by surprise by PAS’ tabling of the hudud bill on Wednesday. After all, the two parties seem to be maintaining some sort of relationship despite slight quarrels now and then. From the reaction of its representatives in Parliament, it looks like DAP was caught unawares, as were MCA and Gerakan. The big question is: did PAS inform its allies in PKR that it intended to force the bill through? If it didn’t, no one would be surprised. PAS has already shown that it is treacherous to the core. It wouldn’t have mattered to PAS that both the PKR President and Deputy President had been speaking about having greater cooperation with it. The hudud bill calls for the amendment of the Syariah Courts (Criminal Jurisdiction) Act of 1965, or Act 355. If passed, it will enable any Malay state to introduce hudud, although the ostensible immediate purpose is to allow PAS to implement it in Kelantan. Under Act 355, punishment by the Syariah Court is limited to a maximum fine of RM5,000, three years’ jail or six lashes of the whip. The amendment is aimed at increasing the lashes to between 40 and 100 and also at introducing stoning for fornication. PAS Youth chief Nik Abduh Abdul Aziz has claimed that the hudud issue will be used as campaign fodder in the upcoming by-elections in Sungai Besar and Kuala Kangsar. Both these places are Malay majority areas. According to Nik Abduh, the tabling of the bill by PAS President Hadi Awang was a signal that PAS and UMNO can, and do, cooperate for mutual benefit. Having succeeded in taking the bill to the head of the queue, Hadi applied for it to be debated during the the next parliament session. The postponement, he said, would allow MPs time to prepare for a meaningful debate. This is suspicious. Why fast track the bill and then postpone the debate? Is this is a tactic to show Malay voters in Sungai Besar and Kuala Kangsar that UMNO and PAS are working together to “unite” the Malays? Or is there another motive? PAS and UMNO have made secret deals before. Perhaps the deal this time is to let UMNO win the by-elections. Perhaps both parties know that many Malays aren’t in favour of hudud and would reject PAS. PKR doesn’t have a leg to stand on for both by-elections. This means that the voters, who are mostly Malays, will opt for UMNO. So, does PKR still want to jump into bed with PAS? Posted in Elections, Hudud, Human Rights, Najib Razak, Pakatan Harapan, PAS, Politics, The Malays, UMNO. 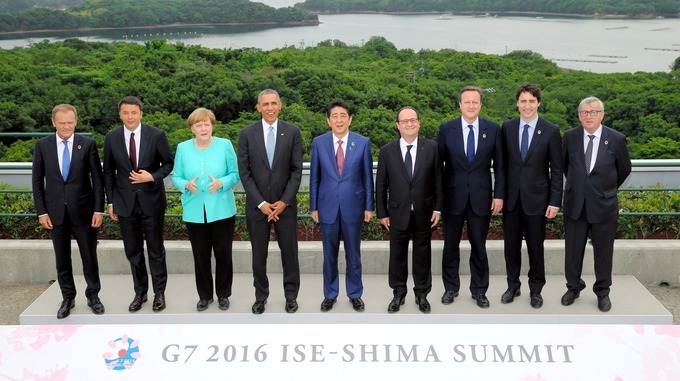 G7 Summit @Shima, Japan: No common workable solutions offered. ANOTHER G7 Summit has come and gone, with the only certainty being next year’s Summit amid more daunting challenges. Leaders of the United States, Canada, Britain, France, Germany, Italy and Japan plus the EU gathered for two days during the week in the Japanese coastal resort of Shima to ponder on the world’s problems. These mostly Western countries have come a long way in trying to tackle global challenges with declining capacity. The modalities of this year’s gathering were predictable, its tenor pessimistic. The chief issues raised were terrorism, refugees and not least, declining growth. These are problems of the world which G7 countries have taken upon themselves to address. The result has been a loosening grip on these already intractable problems. Typically, no common workable solutions were offered by the end of the Summit. Terrorism has long been a scourge throughout the world. With neither “terrorism” nor its root causes identified, acknowledged and defined, it will long remain a scourge. Much of that applies to mass refugee flows. To the West, which the G7 implicitly represents, the problem is how to handle, reduce or stop these influxes. To the source countries of refugees however, the problem is a home nation made uninhabitable through devastation and war. According to the UN High Commissioner for Refugees, the three main source countries are Syria, Afghanistan and Iraq. These are countries that the West has bombed, attacked and invaded in recent years. An obvious solution for the future would be to end Western militarist ventures abroad. But there was no indication the Summit acknowledged this any more than it could identify a solution for declining growth. The most that it could achieve this year was to produce a declaration thick with phrases like the need for “inclusive growth” that is “sustainable” because of “weak demand” and “structural problems”. There was also the customary denunciation of protectionism and all trade barriers. The International Monetary Fund, a key G7 participant, staunchly displayed its Bretton Woods DNA in the face of multiple global challenges. As host, Prime Minister Shinzo Abe was keen to impress and to leave an imprint, perhaps even to establish a legacy. So he tried to sell his “Abenomics” formula as a solution to the world’s economic problems. This comprised a fiscal stimulus, monetary easing and structural reforms. Unfortunately for Abe, by the first quarter of 2016 Abenomics was discredited widely as a failure in Japan and abroad. Among other things, it began by ignoring Japan’s debt problem and then enlarged it. Abe tried to spook his guests into believing that the beginnings of another 2008 crisis were already at hand. But they should know a thing or two about that crisis since they started it, and said current problems were only its tail end – albeit almost a full decade later. At the Summit Abe could not even get his first stage, fiscal stimulus, to be accepted by his G7 guests. They politely countered that each country would have to find its own solution. Britain, Germany and the IMF in particular were dead set against a fiscal stimulus or monetary easing, let alone both. Any structural reforms deemed necessary would then be very different from those of Abenomics. The final joint declaration agreed only to depressed growth being a problem, not to a solution for it. This did not stop Abe from claiming in his closing address that the G7 had agreed to apply Abenomics for the world. Another issue the G7 tried to grapple with was the global steel glut with the focal point on China. But China, which produces half the world’s steel, was not mentioned. China had already cut production by 90 million tonnes, with plans to cut up to another 150 million tonnes in the coming years. But its industrial momentum is such that, as Japan acknowledged, it is a challenge simply to slam on the brakes. One result has been the United States slapping a 522% tax on Chinese steel for property construction and automotive manufacture, while still complaining of protectionism and trade barriers. US steel producers blame Chinese state subsidies and China blames unfair Western practices. The rest of the world sees an unrepresentative G7 posing as the world’s saviour. This year’s Summit also expressed concern over developments in the South China Sea without mentioning China, but still incurred Beijing’s displeasure. That could conceivably have been avoided if China was a member. The G7 began in 1974 as an informal meeting of finance officials from the United States, Britain, France, West Germany and Japan in Washington. They were supposed to be the economic movers and shakers of the world. Then this Group of Five in 1975 grew into the G6 with the inclusion of Italy, with meetings of the finance ministers and central bank governors of the five Western countries and Japan. Later Canada and then Russia joined to make it the G8. It became the G7 again after Russia was excluded, following strategic differences with the West over Ukraine. Today the G7 plus EU remains very much a Western entity, comprising six Western countries and Japan, a US ally. More than half the members are already in the EU, with effective EU representation again amounting to additional Western membership. The G7 still holds itself up as the arbiters of global economics, but how credible is this claim today? The world’s highest scorers in (nominal) GDP per capita are Luxembourg, Switzerland and Qatar, and in PPP (purchasing power parity) terms are Qatar, Luxembourg and Singapore. Granted, these countries may lack the global heft of major powers, but what are the economic standings of the G7 countries themselves today? In nominal GDP per capita, the United States, Britain, Canada, France, Germany, Italy and Japan come in 5th, 13th, 16th, 22nd, 20th, 27th and 25th places respectively. In PPP terms of GDP per capita, they are 11th, 21st, 27th, 25th, 20th, 32nd and 29th. Several private Western sources list the world’s 10 most influential national economies (alphabetically) as Brazil, Britain, Canada, China, France, Germany, India, Italy, Russia and the United States, albeit in different orders. Britain’s Telegraph newspaper group, which adjusts influence based on certain criteria, lists Indonesia in place of Italy. Russia is now excluded from the G7 because of political differences, while China and India are excluded because they are still developing countries. But these distinctions are ultimately subjective. What matters more, particularly for the G7’s own credibility, is how relevant its membership still is for the issues it seeks to tackle. The lack of “fit” has only produced a common frustration. It is a frustration seen on both sides of the “Brexit” issue. A lack of fit has made one side want to pull Britain out of Europe, while the other sees a solution in redefining its presence there. It is also a frustration seen in last year’s G7 Summit protests despite its remote location in the Bavarian mountains. Protesters saw a lack of fit between the G7 and real world problems. In the United States, a sense of frustration from a lack of fit in current institutions and practices has led to the Trump and Sanders candidacies in the presidential election. Adjustments or upheavals then naturally result. Bunn Nagara is a Senior Fellow at the Institute of Strategic and International Studies (ISIS) Malaysia. Posted in Barack Obama, Economics, Foreign Affairs, Global Issues, Governance, International Affairs, TPPA, Trade and Investment.